In the age of flash-based storage and solid-state drives, storage developer Seagate is continuing to make the case that there’s a lot of life left in traditional hard drive storage: the company has just announced the GoFlex Slim, which it claims is the world’s thinnest external drive with a total thickness of just 9mm. But inside that tiny case, the drive also packs some punch: it spins at 7200 rpm, offers 320 GB of storage, and sports USB 3.0 connectivity for super-fast transfers. Of course, the drive is backward compatible with USB 2.0 devices, and it powers off the USB bus itself so there’s no power adapter to carry around. The GoFlex Slim is based on Seagate’s Momentus Thin hard drive, and supports for 192-bit Triple DES encryption so users can be assured their data is safe even if the drive is lost or stolen. 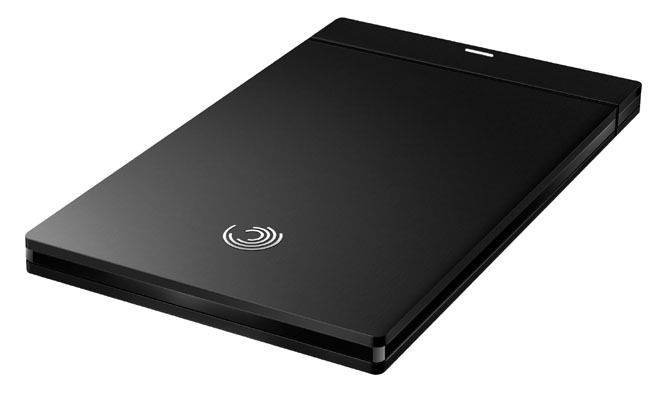 The drive comes in a black anodized case, and Seagate ships it with a USB 3.0 adapter and an 18-inch USB 3.0 cable. The drive comes formated for NTFS and pre-loaded with encryption and synchronization for Windows; it can also be paired up with TVs using Seagate’s GoFelx HD media player. The Seagate GoFlex Slim is available now from Seagate and selected online retailers for a suggested price of $99.99. Seagate also plans to launch a Mac-specific version of the GoFlex Slim, with a metallic finish and pre-formated for HFS+ so it can be used with Apple’s Time Machine backup software, it should be available at Apple retail outlets in May for $99.